TPU reports AMD previewed an official reference-design for the Radeon HD 7990 dual-GPU graphics card at a GDC press briefing. PowerColor, VTX3D and Club3D have been selling 7990 cards for quite some time now, but now AMD reveals an official reference design. Codenamed "Malta", the company claims the card is "whisper quiet" thanks to a triple-fan cooling solution. 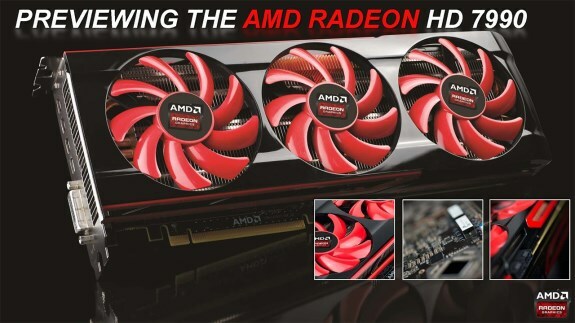 AMD's belated move to launch the Radeon HD 7990 reference design could reiterate the company's long-haul strategy with the Radeon HD 7000 series, which could sail the company through the crucial Summer sales season, over to Q4 2013, when the company is expected to launch its next GPU generation. AMD's reference design HD 7990 enjoys an edge over current market offerings: dual-slot thickness. It uses three 90 mm fans to cool a complex heatsink cooling the two GPUs, the bridge chip, and the VRM to feed them all. AMD didn't speak much about the card, but mentioned that its triple-fan approach is paying dividends. "It's whisper quiet," commented Matt Skynner, general manager of AMD's graphics business unit.